To see Kitty Clark Cole in action is to witness an athlete truly in love with her sport. An accomplished runner, she has completed 17 marathons on all seven continents, including a 2001 marathon off the coast of King George Island in Antarctica that can only be described as epic. (Because of treacherous weather, the marathoners were unable to disembark to shore....and instead ran over 400 laps on one of the ship's decks while it sailed through ice-strewn waters.) As a tough, seasoned triathlete, Cole trains hard year-round and has competed in many multi-sport events. You might think Cole has been doing this all her life. Not so. "I'm an adult-onset athlete," said Cole firmly. She began competing at age 45, and recently celebrated her 57th birthday. 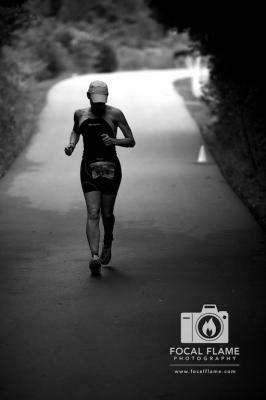 Despite all the authentic joy etched in her face during a race, Cole came to endurance sports through sorrow. "My older brother was a marathoner in the 80's and he wanted me to train and run a marathon with him...which I didn't do because I thought it/he was crazy," wrote Cole in her nomination for the Focal Flame Photography "Honoring the Athlete" contest. She never got a chance to join him. Jim, known by his nickname "Butch", died during a race in Madison, Wisconsin. "At his funeral I promised him I would train and run one marathon to honor him and his passion," wrote Cole. And train she did, completing the Marine Corps Marathon in 1998. Twelve years later, she is still running...and now swimming and biking as well. Not only has Cole benefited from fitness personally, she is dedicated to sharing her experiences with others. Trading the corporate world for a career in health coaching, she recently earned a degree in integrative nutrition and certification in health coaching to complement an MBA and undergrad degree in nutritional sciences. Much of her time is spent encouraging other athletes - as a teammate, health coach, and leading seminars and club runs at All Season Runner, a new store in Janesville, WI. In 2010 she also served as Race Director for the inaugural Rock Roll N Run Triathlon in Janesville. Cole's 2010 competitive season was chosen with care. To punctuate the long crescendo to Ironman Florida in November, she selected several shorter-distance events. Key among them was the Door County Half-Iron. "This is my 2nd Door County Half and it’s a beautiful race," said Cole. "The scenery is spectacular and is a great destination for a holiday with the race." Heading into the race, Cole wrote about possible challenges. "I struggle in rough water - I actually get seasick if the waves are high," she said. "It’s hard to throw up and swim but I’ve done it a couple times!" To improve her bike times, Cole prepared with intense off-season training. "I participated in the PBC (Power Based Cycling) Program at SBR [Coaching] over the winter, a 26 week, twice a week indoor cycling workout," she said. "I’m stronger on the bike than I was a year ago." Cole considered herself fully recovered from breaking her ankle in 2009 while coaching a run, but realized that the steep bluff on the Door County half-marathon course would likely aggrevate the injury. While Cole prepared for the event, photographer Clint Thayer lined up all the logistics needed to document her race day. When asked about the challenges of custom sports photography, Thayer said, "It’s like the intensity of wedding photography - but the bride is moving at 20 mph throughout the entire day, in a crowd of over 900 people, for 7 hours." There were many details, both large and small, that were critical to ensuring a successful shoot. Of course, Mother Nature weighed in. Athletes awoke to drab skies, rain-slickened asphalt, and the potential for strong storms. Thayer remarked, "Photograpically the day itself was very overcast so it provided its own diffuser of light - which was really somewhat helpful." Athletes were less enthused. "The rain scared me and spooked me a bit. I get cold easily...when it started raining I had a flashback to IronMan Wisconsin 2006 which was a cold, rainy and miserable day. I developed hypothermia that day and got pulled off my bike with no feeling in my entire body, my first DNF [Did Not Finish]." Cole readied her transition gear and tended to pre-race rituals - such as donning a pair of boxer shorts from her son, Joe, and a ring from her daughter Anna. Though her children weren't present to cheer her on personally, Cole shared that she wore the mementos so that her loved ones would be there in spirit as she prepared. When she engaged Focal Flame Photography to document her season, Cole said that she wanted to capture the memories for her family, saying that she wanted her children and any future generations to know they come from "strong stock." The weather delayed the start by half an hour. Cole passed time with friends, including training partner Brenda Knighton-Slatter. Cole and Knighton-Slatter race in the same age group. With razor-sharp wit, they cultivate a friendly rivalry - one backed by a long history of training and supporting each other. The National Anthem played; the gun fired; the swimmers plunged. And for the next 6 hours, 38 minutes, and 46 seconds, Cole was in the zone. Triathlon is a deeply personal, deeply mental journey - a journey to the heart of oxygen deprivation. To a place where the rhythm of breath, stroke, pedal, and footstrike subtract all internal chatter. In the hours of long triathlon events, the only voices remaining are those that are most central. And for Cole, as with every event, the voice that echoed in her head was that of her brother Butch. "I feel my brother's spirit any time I run or race and many times that is what keeps me going when the going gets tough," she wrote. After a solid swim, Cole transitioned to the bike and withstood showers that increased to a downpour. "Within the first mile of the bike, my computer failed...just stopped working," she said. "I rode as hard as I thought I could hold, totally on feel and effort. I think I did better by not constantly having to look at the computer - that surprised me." In high spirits, Cole begain the run - her favorite sport of the three. "She flew," said Thayer. "Absolutely flew." Cole recalled, "I knew when I came in from the bike that if I had a good half-marathon...I would [achieve a] PR [personal record for the half-Ironman distance]." She kept re-calculating her finish line every mile of the run until miles 10 and 11, when her ankle injury flared. "I experienced “brain lock” about that time and just couldn’t quite make the numbers add up after 10 [miles]. When I was able to start running again at 11.5, I knew I had it and I cried. I feel like I’ve recaptured the “fire in the belly,” racing and training attitude that I used to have and it all came out at that moment." True to her character, Cole encouraged others even as they encouraged her. "I was running past a family group sitting in lawn chairs who were cheering for the runners...They said something like, 'You’re looking good,' to which I always reply, 'So are you and thanks for cheering.'" At that point, one of the bystanders noticed the age marking on the back of Cole's right leg. "When I ran past one of the women said, 'My God, she’s 56 years old.'" Cole responded, “Yes I am - and old broads rock!'" In the end, Cole's time was approximately 44 minutes faster than her 2009 Door County race, and approximately 16 minutes faster than her record for any triathlon of that distance. "I’ve always believed there’s a point in a race when you know you’re going to finish...sometimes it’s at the start, sometimes at a point during the race, and sometimes it’s not until you cross the finish line," said Cole. "I felt like I was going to have a good day when I got up that morning. I was hoping for a PR and was willing to work hard for it and felt it would be in my reach." With the Door County Half-Iron completed, Kitty Cole continues her focus on a heroic effort - training for the IronMan Florida race in November. In tribute to the active and veteran soldiers who are her personal heros, she is raising $50,000 for the Injured Marines Semper Fi Fund - enough to support the purchase of three to four prosthetic limbs for wounded U.S. Marines returning from combat. Read more about her fund raising campaign in this press release and in her appeal for donations, and contribute online at her fund raising page. 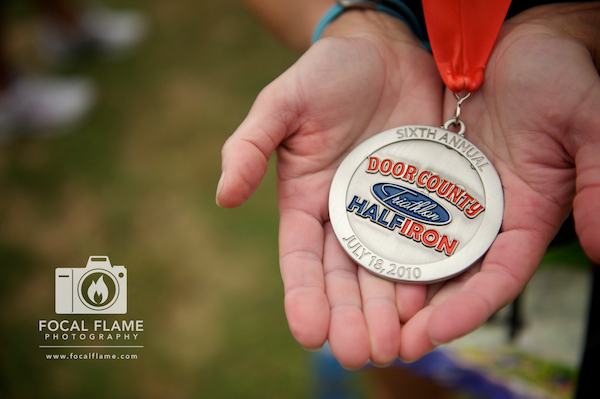 View more photos of Kitty's 2010 Door County Half-Iron in the gallery.